*Excluding holidays; add an additional business day (Monday-Friday) if one of the following holidays falls within the ORDER DAY and DELIVERY DAY (inclusive): Memorial Day, Independence Day (JUL 4), Labor Day, Thanksgiving, Christmas Day (DEC 25) or New Year's Day (JAN 1). The following chart provides FedEx Ground shipping transit estimates in business days. For specific transit time information from one ZIP/Postal code to another, please go to Get FedEx Rates & Transit Times under the Ship tab on fedex.com. Party Swizzle's origin shipping zip code is 37206. FedEx Ground delivers Monday through Friday (excluding holidays) to commercial addresses. FedEx Home Delivery delivers Tuesday through Saturday (excluding holidays) to residential addresses. 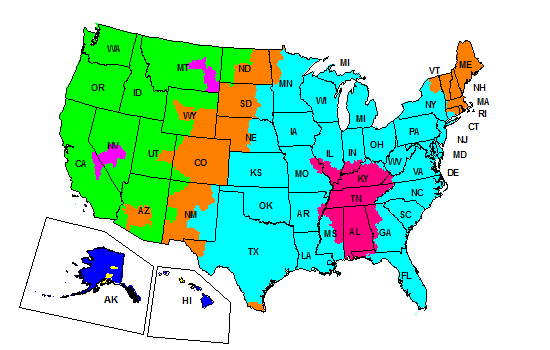 The map above is a general representation of transit times for FedEx Ground shipments to commercial destinations. In limited areas, transit times may differ between shipments to commercial and residential destinations. For specific transit time information from one ZIP/Postal code to another, please go to Get FedEx Rates & Transit Times under the Ship tab on fedex.com. We do ship to other countries! You can change the destination country when you fill out your shipping information during checkout. You will have the opportunity to review the shipping cost before submitting your order for payment. * For many major markets. Average number of days may vary based upon origin and destination. NOTE: This is not guaranteed delivery and we have had shipments take as many as 14 business days during peak holiday season. Most of our international customers tell us they receive their packages within a couple of weeks. IMPORTANT: Every country has its own rules and regulations regarding imported products, which may include custom duties and fees. Please note that your order could be assessed additional charges by your government.